Welcome to my blog where I’ll be discussing overlanding travels around the Pacific North West. What is overlanding? 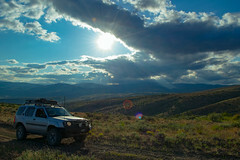 “Overlanding is about exploration, rather than conquering obstacles. While the roads and trails we travel might be rough or technically challenging, they are the means to an end, not the goal itself. The goal is to see and learn about our world, whether on a weekend trip 100 miles from home or a 10,000-mile expedition across another continent. The vehicle and equipment can be simple or extravagant – they, too, are simply means to an end. History, wildlife, culture, scenery, self-sufficiency – these are the rewards of overlanding, (taken from the Overland Journal site)”. I’ll be posting photos as well as comments on the various locations I visit. I’ll also post tips, tricks and techniques to help you with your exploring. It’s likely I’ll also touch upon overlanding gear, including vehicles, tools, hacks, essential checklists and must-haves.